The first pinhole camera principles were documented by Chinese philosopher Mozi in the 400 BC! The first camera obscura, the ancestor to the modern cameras we use today, was actually developed in 1011. The movie camera we use can continuously takes 24 film frames per second (as long as the user holds down the shutter button, or until the shutter button is pressed a second time). 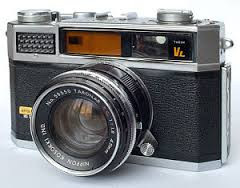 Cameras are used to capture a real life image, that could be still or moving, and they have been used for hundreds of years, however their form has changed many times, to what we see commonly today, the digital camera. The principal of cameras was first recorded in the 400s BC by Mo Ti, who was a Chinese philosopher; the principal being a projected, inverted image that comes from the captured light of an object through a tiny hole in a dark place, which is known as the pinhole principal. The first camera that was transportable was designed by Johann Zahn in 1685, although more less practical cameras had been designed. Olden day cameras were boxes with a lens and a glass screen, and used light sensitive material to capture the image, which could be damaged if exposed to too much light. Different types of cameras have different advantages, such as some cameras take better quality images while other cameras have a better focus. The actual name of the Kodak, the company popular for camera devices, is Eastman Kodak Company. Kodak lost a patent battle with Polaroid Corporation and has left the instant camera business in 1986. Fujifilm, the Japanese popular photographic film and camera maker actually got its name from FUJIC, the company behind Japan's first electronic computer. SLR actually means Single Lens Reflex. An early camera, known as ’camera obscura’, Latin for ‘dark chamber’ or ‘dark room’, was only used to project a copy of the real life image so artists would be able to copy from the projected image with precision. Cameras originally captured images on light sensitive material, later known as film, in a black and white format, but in the late 1800s a chemical process involving dyes was invented so cameras could capture coloured images, although it wasn’t until many decades later that amateur photographers used coloured film. Cameras can be found in many places and are used for many things such as checking a moving vehicle’s speed, monitoring shops in case of robberies and capturing images or movies, and are now included on most mobile phones. Cameras often come with artificial lighting, known as a ‘flash’, so objects appear clearer. Modern digital cameras, which are the most common cameras in use today, use an electronic image sensor to capture the image, which is then stored in its memory until it is downloaded to an electronic device like a computer or printer.